Aaahhh… we’ve come to the end of another summer. I guess technically it’s not for a few more weeks, but school (finally) starts in three days so I’m counting it the end and welcoming in my favorite of all seasons… Autumn! I hope you have all found enjoyment travelling with your family this summer, and if so you probably have a positive avalanche of digital photos that you’ve faithfully transferred off your phone or camera and left sitting on the computer, waiting for that elusive day when you have enough time to organize, file, edit, print and catalog them into your favorite album or scrapbook. Yeah right. I hate… Hate… scrapbooking. It is my least favorite of all mommy jobs. Yet, I continue to save pages and pages of their school work every year, I keep every team photo and concert program, and yes, I continue to collect thousands of pictures, desperately trying to preserve the moments that are ever more quickly slipping away from me. Thirteen summers? I’m now officially down to three for Aubrey and nine for the twins. Ugh. Though I can’t do much to help with the school papers and concert programs, I wanted to share what I use to preserve the digital memories of our summer trips. 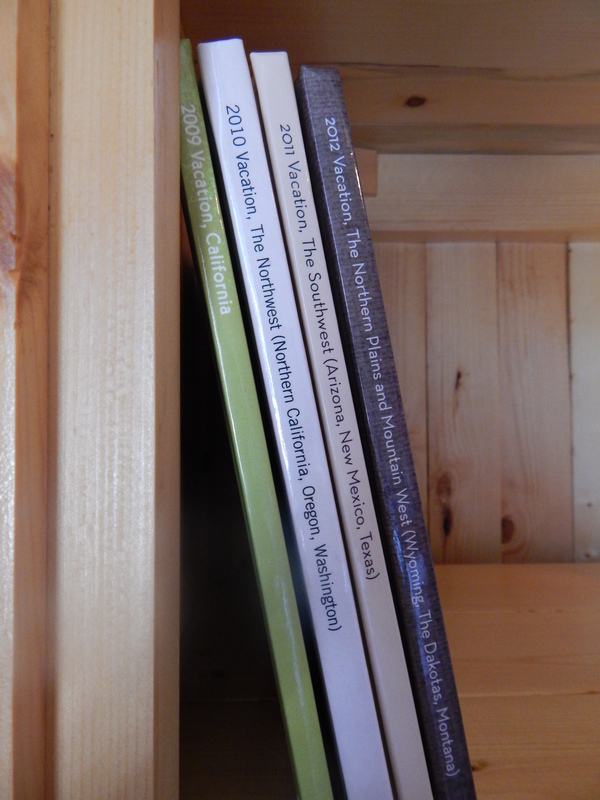 Many of you have probably already heard of Photo Books and are using them regularly, but I wanted to share this idea just in case you haven’t come across it yet. I hadn’t heard of it until last year during a visit to Illinois and I saw the photo books my cousin had created that chronicled the first year of life for her newborn. They were beautiful! And what a convenient way to use all the digital photos we have instead of actually sending out for printed copies and then storing them in traditional photo albums. Thanks Ginny for the idea! 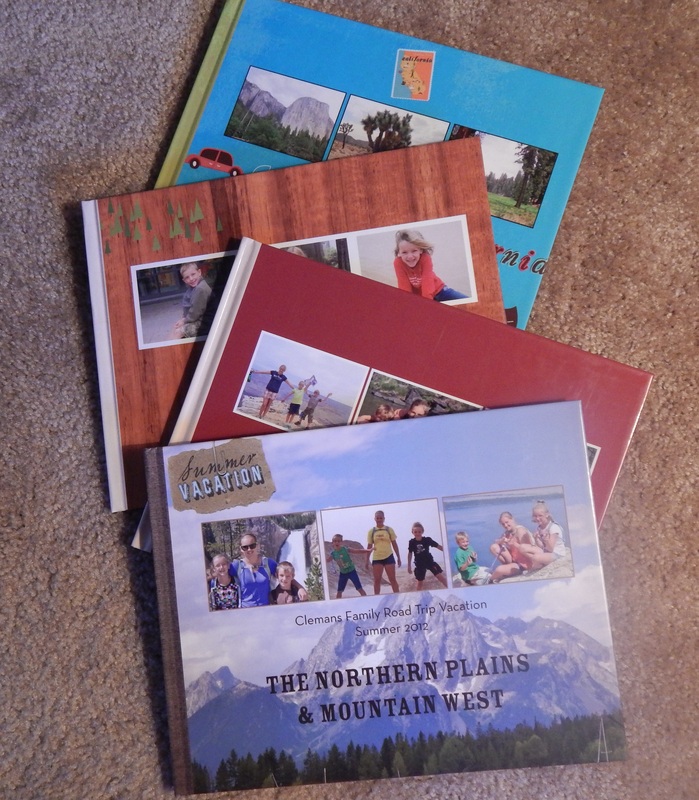 I plan to use the photo books for all my photos, but I especially love them for our summer road trips. I’m a faithful customer of Shutterfly.com. They have hundreds of beautiful templates so you can pick a theme or style to make each book unique for each trip. And they are so easy to make! You just upload the photos that are already on your computer, drag and drop them into any layout you want, and then write comments or stories anywhere on the page to describe your photos. You can customize the front and back cover with photos, and there are all kinds of various “scrapbooking” stickers and details with which to further customize your pages. Furthermore, the process of creating a photo book online goes fairly quickly without the paper and glue and scissors and “scraps” of traditional scrapbooking. I like being able to create the book once and then order as many copies as I like. I’ve ordered one of each trip for each child so that they have their own photo albums with which to remember our travels. I’ve even ordered some for grandparents and other family members. They make great Christmas presents! I also like these books because unlike bulky photo albums, they are very neat and compact and take up very little space on the shelf. So, I realize that this won’t take care of all our scrapbooking projects, but if you create a Photo Book and keep the Trip Binder for each road trip, then I would call this project Done! Wishing everyone a very smooth transition into the new school year and a very beautiful Autumn!